Put me in the "Ask Permissions" category. Models are posted at www.b5sc.com. If you can convert out of Conitec A6 .mdl7 format, feel free to use, subject to above. I have no problem with it...good idea actually. To save mankind-yourself you scorned to save." Mark me down as... Do what you want with it! If it's up for download... use it!!! anyone know what KF's policies are? Or platfafa's? What a person does "for the good of the community" is up to them!!!!! Personally I think just making a model is enough, so their wishes about use and posting should be respected. Can i ask why the outbusrt? Sorry for the outburst. I should have said "battleclinic users"
It was not directed at you personally, I know that you are not responsible for what people upload to battleclinic. Nor was it intended to defame the site. I just thought that I could download from battleclinic without worrying that the model had been posted without the permission of the original creator. I guess I am just frustrated at the number of great modellers who have posted saying "no more models" because of problems with theft or reposting. Heh well most of my stuff is posted on Battleclinic with very little or no permissions. Partly my own fault for trusting people as I have never included readme's with credits other than source credits for kitbashes. However I honestly don't care, I'd be happy with a little credit for my work but if not I'm not gonna go postal unless someone starts claiming my work as their own. 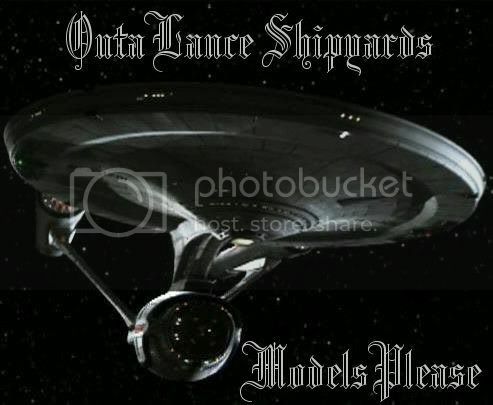 However for everyones information models posted to the scrapyards will be placed there only at their creators behest. All kitbashes are to be accompanied by a readme for credits at least to the materials originator(s). I will not however ask people if they had permission from the models originator to kitbash it, that is between them. Also nothing will be posted on the scrapyards with the infamous "author unknown" or some crap like that. Just wanted everyone to know where I stand on the issues. You can put me down in the credits only category. Oh and in addition anything posted on the scrapyards is to be reposted ONLY with permissions of the author. Perhaps Battleclinic should review ships before posting them, like sfc3files does. I think that would definitely cut down on the number of ships with no credits or incorrect credits that find their way there, and help set our distraught modelers' minds at ease, knowing that people are actually checking up on what goes on Battleclinic before it's available to the public. IMO it fits in with the whole idea that we modelers "take care of our own". Don't take this the wrong way, it's supposed to be informative - not a rant. As a general rule even for the ones on credit only I make it a habit of saying, "Hi, I liked your model a lot and wanted to use it. This is what I am doing". Yeah he is on the list for 'Credt Only', but I still would like to let him know what I am doing with his F-302!!! There are many authors both on and off the list who are in the same situation. First recourse is to track down a Trek site they are active on and see if they posted an email there (hopefully they did) or leave a PM for the next time they log on to that site. Second is to publicy ask what the heck if this guy's email lol! This list is a great idea! I would like to just make sure the authors in the ask me category can actually BE asked. OH sh*t!!! This is one place I forgot to change my addy...sorry SD and anyone else been trying to reach me. Here's current addy... sandman3d@gmail.com and I'll be updating my profile...again. Holy time warp Batman! (as we already talked lol) Np, you and DD are in the same SG-1 thread (and this seems to be the BEST site in general to track people down in regards to SFC3 and Trek.). Game on! I was just going to suggest something similar, and place this information over at the BC community as well. Additionaly alot of people aren't list here. GAFY for instance. I forget who else people have been asking me about that haven't been on he list lately. Having more people sign up and adding contact info would be good. Anyway THIS is the guy "Little Ludi" some people have been confusing me with. As usual he ports ships from every Trek game (like we do) HOWEVER he supplies no read-me's except his own. sie nur auf freespace2 portiert. und Ultimate Unwrap3D zerlegt und erstellt. I downloaded like 20 packs he posted way back on FS2 sector and that UNINTENTIONALLY pissed Raven Night off (Justifiably!) when I posted his USS scorpion once and he PM'ed me! This is the other site he uploads to... And where I started to fill in my ship lists like 2 years ago befoire I got wise. I'm sure he doesn't intend to disrespect anyone HOWEVER even after I keep mentioning in threads the lack of recognition for the' artists it hasn't made a difference. Maybe if anyone here speaks German they can mail him and get him to fix those read me's? I've made posts on sites warning poeple that those Downloads should only be for "private" use and not for a publicly posted mod due to permission issues. I didn't want anyone else to end up in the few situations I did that fortuantely got resolved with Raven and then shortly after ATOLM! anyone know the useage rules for zorg? i Agrea with the asking permission before posting mod or kitbash to place like battleclinic, so i was wondering if mod (old one) and kitbash or just texturing was ok to post on a personal web page?, also does anyone know how to contact atra?, i try the hotmail address but there no respond, all the retexture i do and kitbash are still on my com, those i made are from WZ old Bellicose DN for a kitbash and newest mod, atra a few kitbash and re testuring (that was easy) i think i use pneumonic belknap (basic model) and someone else, well i know that WZ don't want is model (new or old) to be put at battleclinic, for atra well i don't think he want (but i have see mod of him or kitbash), for pneumonic well anyway i will wait for them to say if the want or not. Models: Use away. I just ask that the all readmes need to be included in the folder. If you wanted to be nice you could e-mail me a link where it's going, just incase I want to check it out. Spec mods: Use only with permission, please.